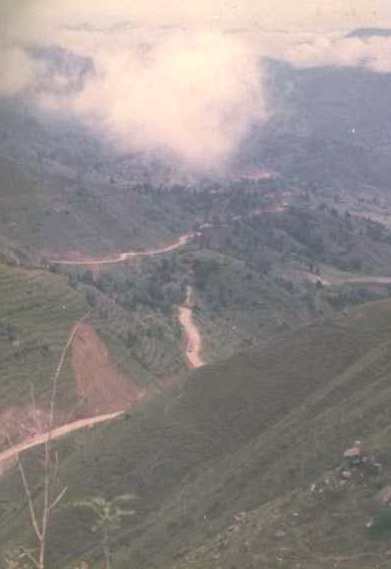 The drive from Khajaraoh to the Nepalese border is full of villages and towns and the task of negotiating the traffic and the signposts a constant and demanding one. On one trip we found ourselves making excellent time but it was only as the sun began to set did we realise that it was on the wrong side! Our best camp site was a quarry and brick kiln just a kilometre or two from the border. We found American Marlboro the best form of baksheesh and we joined the two nightwatchmen in their compound for the night. As dusk settled we bombarded the trucks trundling up to the border with an array of fire-crackers and rockets. Being India this pyrotechnic madness was regarded with good nature by the truckies and as just par for the course! From here the road takes the overlander into the Himalayan kingdom via its second city of Pokhara and then on to its capital Kathmandu. 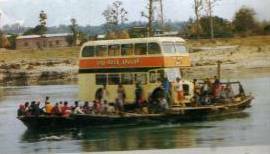 An option existed to reach the capital via the Chitwan National Park and later trips took this on which included placing the bus on a punt. 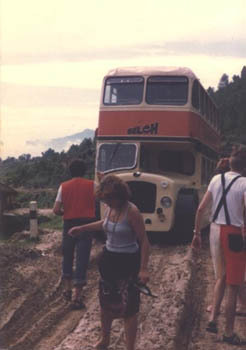 In the 1980’s Nepal was a relaxing and welcoming haven for overland travellers. In the years since the nepotism of the ruling families has seen the ordinary Nepalese become increasing disenchanted with the status quo. Despite these troubles, which include a Maoist insurgency, the ordinary traveller is not unduly affected. Pokhara with its tourist heart laid out around its beautiful lake is a staging point for trekkers seeking remoter destinations. We stayed in the guest houses that dot the fringe of the lake. They were low budget affairs but the setting and the people were the real attractions. A relatively easy day’s drive takes you to magical Kathmandu and the end of your journey. The scenery is just mind-blowing with the road following a ribbon of land beside the rushing waters of the ?? 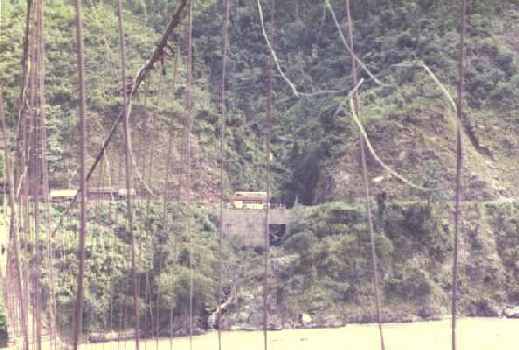 river that has cut a track through the Himalayan foothills. There are countless chai stops along the route with amazing rope bridges fording the banks of the river. One of the great shocks for the western traveller was seeing women and young children carrying great loads. The men seemed to have it easier but that was only relative - it stressed the point for me how atypical and privileged was the lifestyle that we enjoyed in the west. In the wet season the roads get churned up by the heavy rains and flash flooding and on any day you will be the witness to an unfortunate accident as the Nepalese drivers push themselves beyond the limit. These conditions can also make travel slow going especially for a vehicle like ours a Bristol Lodekker that had been designed for quiet English laneways! On the first day of my last overland trip it was everyone out as we negotiated the potholes wheel rut by wheel rut. I am not sure what the punters thought about it at the time - their eyes were as big as saucers and one can only imagine how they thought we would make the 15,000 kilometres to London! Like a lot of such things in life, this was an excellent team building exercise that brought the group together.